Some unusual circumstances for this video release: While shooting "A Bug's Life," Pixar was simultaneously prepping the video, so every shot was digitally mastered two different ways -- once in wide-screen format for theaters and once in narrower format for TV. The practical upshot of which is that very little is lost in the "translation," save panorama shots. Transfered directly to DVD from the original digital source. It doesn't get any crisper than this, folks. If you want all the DVD bells & whistles (commentary, making-of & tons more), you want the Special Edition 2-disc set. I do NOT recommend the 2003 Collector's Edition. It has games for children and quite a bit of behind-the-scenes stuff, but it's lacking the commentary and several other bonuses found in the Special Edition. To answer your first question, "A Bug's Life" is, strangely, exactly as good as "Antz," the other animated insect movie that beat this one out of the gate by just a few weeks. To answer your second question, seeing both movies will not feel redundant as they're both terrific for entirely different reasons. "A Bug's Life" is not as complex or sophisticated as "Antz" -- DreamWorks' insect movie had socio-political undertones and starred Woody Allen's voice, while Disney and computer-animation house Pixar are, naturally, aiming more clearly for the kid market. The stories, while similar in their themes of individualism and self-esteem (and, of course, ants), are divergent in mood and sense of humor. While the computer animation in "Antz" was terribly impressive, especially in its scale, I was positively floored by the artwork in "A Bug's Life," in which computerized images are often so realistic you forget the entire thing is a cartoon. In "A Bug's Life," an inventive, accident-prone ant named Flik (voice of "NewsRadio's" Dave Foley) sets out from his anthill on a mission to recruit mercenary bugs to help defend his colony against a band of oppressive grasshoppers, led by the gloriously tyrannical Hopper (voice of Kevin Spacey), who regularly fly by to terrorize and steal food. Flik ventures off to the "big city" (a trash can outside a mobile home) where urban sight gags abound -- a multiple-limbed street mime, a drunk mosquito ("Bartender! A Bloody Mary, O-positive! "), a homeless fly holding a cardboard sign that reads "kid pulled off my wings" -- and finds himself a company of out-of-work circus bugs he mistakes for insect toughs. Notable members of this band include a ladybug, voiced ironically by gruff comic Denis Leary, a plump German caterpillar with a ferocious appetite (Joe Ranft) and a pair of acrobatic Hungarian pill bugs (both Michael McShane) who provide all the movie's best laughs. Through one of those misunderstandings that happen only in the movies, they all return to the anthill with Flik, thinking they've been enlisted to perform instead of to fight, and much adventure ensues. "A Bug's Life" is directed by John Lasseter, the Pixar computer-animation mastermind whose "Toy Story" opened the door for this kind of film in the first place. Suffice to say the art form has grown by leaps and bounds. The sophistication of the animation here is unsurpassed. Crowd scenes with thousands of ants appear completely natural as if every single bug was animated individually. Trees and fields of grass are so realistic as to invite doubts that they're animated at all. The cookie box the circus bugs travel in has small flakes of cardboard around its edges and, because of the scale, the microscopic dots of color that make up the pattern on the box are visible. 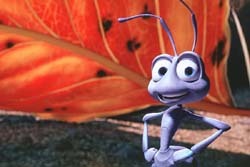 Even Flik's eyelids have small wrinkles when he blinks. Yet it's all so seamless none of this unequaled artistic accomplishment distracts from the story, which follows a similar track as other Disney 'toons, with confidence and self-esteem lessons to be learned, and stock characters (bad guy's bumbling henchmen, etc.) to be reinvented. After coming under attack by a hungry bird in one of several memorably realistic sequences, Flik develops a plan to scare the grasshoppers away with an elaborate decoy bird made from leaves, acorns and sticks, which becomes the rallying point for the ants and leads to a climactic showdown between Hopper's minions and the ants. The animation only gets better toward the end, including a scene in which the ants run for cover in a rainstorm that, from their perspective, feels like aerial bombardment. "A Bug's Life" isn't another "Toy Story" or "The Lion King" in terms of its eventual ranking among animated classics, but it's another strong volley in what is shaping up as a battle for cartoon supremacy between Disney and DreamWorks in which the audience is the big winner. These movies just keep getting more entertaining, more inventive and more visually dazzling. Whatever you do, don't leave "A Bug's Life" until the credits have finished rolling because they run along side hilarious mock "outtakes," in which bugs flub their lines, crack up on "the set," bump into the camera and get clobbered by boom mikes. The movie is a joy, but honestly this bit alone is worth the price of admission. P.S. As an additional treat, the Oscar-winning short "Geri's Game" -- also a Pixar product -- is attached to the front of the film.